Appearing as the black circle in the center of each eye, your pupils serve as the windows through which light enters your eyes. This function is critical as you are able to see only when light rays reach the retinas deep inside your eyes. Muscles within the colored part of your eye, called the iris, control the size of your pupils. Pupils are considered dilated when larger than about one-quarter inch, the size of a pencil eraser. Dilated pupils, known as mydriasis, most often occur as a normal response to stimuli such as dim light, anxiety, fear or pain. Mydriasis can also develop in response to certain drugs, herbs, venoms or toxins. Some eye diseases and neurologic disorders may likewise cause dilated pupils. Dilated pupils are usually a normal response. When you are in a dim environment, your pupils automatically enlarge to let more light into your eyes. The additional light reaching the retina allows you to see better. In times of excitement, anxiety or fear, your sympathetic nervous system activates and causes the release of adrenaline and similar substances in the body. Activation of the sympathetic nervous system produces dilated pupils as well as changes in other parts of the body, such as increased heart rate, blood pressure and breathing rate. Pain or sexual arousal causes similar sympathetic stimulation, leading to dilated pupils. Some eye drops cause dilated pupils. They are typically used by ophthalmologists to help them see the inside of the eye during an eye examination or surgery. Certain eye diseases are also treated with dilating eye drops. Two types of eye drops produce mydriasis: sympathomimetic drops and parasympatholytic drops. Sympathomimetic eye drops, such as phenylephrine, directly activate the sympathetic nervous system within the eye to induce pupil dilation. In contrast, parasympatholytic eye drops block the activity of the parasympathetic nervous system. As this system causes the pupils to become smaller, eye drops that block its activity leave the dilating effects of the sympathetic system unopposed, producing mydriasis. Common parasympatholytic eye drops, also called anticholinergic eye drops, include atropine, homatropine, cyclopentolate (AK-Pentolate, Cyclogyl) and tropicamide (Mydriacyl). Stimulant drugs, such as cocaine and amphetamines, can activate the sympathetic nervous system and produce dilated pupils. They reach the eye after being absorbed into the bloodstream. 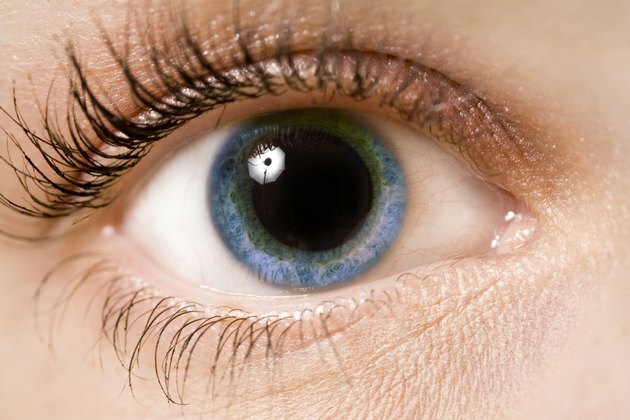 Dilated pupils can similarly occur with hallucinogens, such as ketamine, lysergic acid diethylamide (LSD), mescaline and psilocybin. Some antihistamines used for allergies or colds have anticholinergic effects that cause mydriasis. Examples include diphenhydramine (Benadryl), fexofenadine (Allegra), loratadine (Claritin) and pseudoephedrine (Sudafed). The pain medication tramadol (Ultram) and various antidepressant medications may sometimes cause dilated pupils by increasing levels of noradrenaline, a molecule producing sympathetic nervous system effects. Scopolamine skin patches (Transderm Scop) used for nausea and vomiting produce anticholinergic effects. When used as recommended, the amount of scopolamine reaching the eyes is usually too low to cause mydriasis. However, dilated pupils can occur if you touch the patch with your hands and then rub your eyes. The jimson weed plant, or Datura stramonium, is used as an herbal folk remedy and sometimes as a drug of abuse because of its euphoric effects. All plant parts can be chewed or used to make tea, and seed pods can be eaten. Jimson weed contains anticholinergic substances that cause dilated pupils, including atropine, hyoscyamine and scopolamine. Other anticholinergic effects may occur as well, such as a dry mouth, flushing, confusion, difficulty urinating and an increased heart rate. Black henbane, or Hyoscyamus niger, is a similar herb containing scopolamine, atropine and hyoscyamine. Venoms of certain snakes, funnel web spiders and puffer fish are additional causes of dilated pupils. These venoms have anticholinergic effects. Exposure to toxic substances such as carbon monoxide, cyanide and methanol may produce mydriasis as well. Anterior uveitis describes inflammation of the anterior uvea -- the iris and an adjacent structure known as the ciliary body. This inflammation can affect the muscles in the iris, causing dilated or constricted pupils, depending on which muscles are most affected. Pupil dilation is beneficial for people with anterior uveitis, as it can help prevent scar formation and reduce pain. Indeed, dilating eye drops are often prescribed if the disorder itself does not produce sufficient mydriasis. Other eye disorders that may cause dilated pupils include some types of glaucoma and cataracts, as well as severe myopia, or nearsightedness. Any eye disease that produces blindness or near blindness in both eyes can also cause dilated pupils. Furthermore, mydriasis may occur after some types of eye surgery. Disorders affecting the brain or nerves connecting the brain and eyes sometimes cause dilated pupils. The midbrain is the region where nerves responsible for pupil size originate. Abnormalities such as tumors or strokes in this area often cause dilated pupils. Mydriasis can also occur with generalized brain damage or increased pressure within the skull, which may result from disorders such as a major stroke, large tumor, traumatic brain injury or encephalitis -- brain inflammation often due to a viral or bacterial infection. Other neurologic disorders that sometimes cause dilated pupils include multiple sclerosis, Guillain-Barre syndrome and botulism. When dilated pupils are due to a neurologic disorder, other signs and symptoms of the underlying disease are generally present as well. See your doctor if you experience dilated pupils that persist in a bright environment and are not using eye drops that cause mydriasis. Pupils normally become smaller in bright light, and absence of this response may indicate a potentially serious medical problem. Be sure to tell your doctor about all substances that you are taking, including herbs and over-the-counter, prescription and recreational drugs. Dilated pupils generally produce no symptoms except increased sensitivity to light and slightly blurred vision. See your doctor right away if you notice dilated pupils accompanied by any other eye symptoms, such as pain, redness, loss of vision or double vision. Seek emergency medical care if you experience symptoms of a neurologic disorder, such as weakness, paralysis, decreased sensation, headaches, nausea or vomiting, lightheadedness or loss of consciousness. Neurological Differential Diagnosis, 2nd edition; John Patten, M.B.B.S.